Just got off the phone with a delightful patient who recently finished an eight-day Accelerated Opiate Detox here at The Coleman Institute where we also detox people off of benzos, alcohol, methadone, and suboxone. I didn’t get to see him much; he worked a lot with Courtney and Dr. Coleman, but I saw him and his girlfriend enough to refer to them as ‘the beautiful couple’. They got home late last night. Bill* couldn’t sleep so he drank a beer and took a Valium. Oops. That did not sit well with Beth*after all the time and money spent, and a rather ferocious row ensued. He first felt overwhelmed with anger, stopping just short of kicking a hole in the wall, followed soon after by incredible guilt and shame. When a person has spent many years of their life on medications that dampen the emotional response to normal every day events, let alone important, life changing events—and then no longer have the drugs in their system, that doesn’t mean the emotions stop. Your emotions will tail you wherever you go. In fact, according to Dr. James Prochaska, the behavioral change guru, it’s one of the biggest reasons people relapse from any kind of behavioral change they are trying to make; you can change your environment to avoid certain triggers, but you can’t get your mind and emotions to move across the country or even around the block. Between growing up in a family that was fraught with addiction issues and being an addict himself, Bill’s got himself a wonderful opportunity for a lifetime of learning how to ‘deal with’ his distorted thoughts, his disturbing emotions, and his painful memories. I told him if he weren’t having strong emotions right now I’d really think something was wrong with him. Bill wondered if there was some kind of medication he might use to help him mediate his labile feelings. Yes, medication may help; however, the longer answer—and in my opinion, the truer answer: it’s going to take a whole lot more than a pill to help Bill. And the good news is--healing happens. Fortunately for Bill, he is crystal clear about what he values. He has an amazing partner who wants him well. He has two beautiful children. He is a devout Christian. He is successful in his work and plans to open his own business in the future. Being solidly grounded in what he values will allow Bill to move forward, taking at least one baby-step every day in committed action toward those values. Becoming immersed in a strong recovery program will help him begin the process—and I emphasize process—of recognizing that although thoughts and emotions are sources of information for us, they are likely to be confusing, distorted, and false on a regular basis. Action is real; action is measurable. We talked about having a big glass jar. Maybe even a jar to represent each of his most important value areas: Family, Work and Faith. Each time Bill does an action step—even a tiny one-- that supports what he values, he can drop a pebble in the jar. A pebble for deep breathing instead of yelling when the kids are running late for school. A pebble for remembering to look into Beth’s eyes and tell her 'Thank You for sticking with me'. A pebble for bringing her a rose on the way home from work. A pebble for getting up an hour early to go to an Al-Anon meeting. A pebble for sitting down and looking at his kid’s math homework. A pebble for opening a door for an employee. A pebble for ‘dying to self’ when an overwhelming urge to use arises and letting God fill the space. I wondered what it would be like for someone to start this tradition and continue it for years. 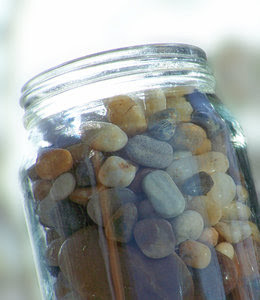 I got an image of a funeral service-- a celebration of a life well-lived-- and on the altar or around the coffin or around the headstone were hundred of bottles full of pebbles. Because the thing is, if you are loving your family only in your head, and not supporting it with actions, how will they ever know it’s real? First things first. Figure out what you are living for. Get off the drugs. Find resources to help with thoughts and emotions. Then, in the words of Nike, 'Just Do It'! Take committed action toward your values. Legal Problems from Substance Abuse?